The technicians of FUNDAP talked to us about the environmental, social and economic benefits of protecting our forest resources, so my brothers and I enrolled the program in order to conduct a technical study of our forest. WWe are a FUNDAP program that was constituted in 1993, which executes innovative projects, not paternalistic, within the framework of alternative technologies, oriented to the sustainable management of the renewable natural resources and environmental improvement, directed to organized groups and poor communities of Guatemala, with the purpose to improve their quality of life, providing related support and focused on the sustainable management of renewable natural resources. We support beneficiaries of the different projects we execute with: strengthening of social organization for environmental purposes, environmental infrastructure (nurseries, forest nurseries, agroforestry, improved stoves, potable water systems), forest management (protection plans, reforestation, agroforestry and production) and environmental education (recycling, environment, clean energy, etc). In a specialized manner, the program supports the preparation and presentation of forest management plans before the INAB National Forest Institute, in order to be included in the different forest incentive programs of the State of Guatemala. • Encouraging owners and owners of small areas of forest land for the sustainable use of renewable natural resources. • Strengthening social and environmental organization. • Supporting environmental infrastructure of a social nature. • Stimulating the protection and use of renewable natural resources. • Strengthening the process of forest governance. The supported area has an extension of 14,205 Km2 (5,485 Square miles), which represent 13.04% of the national territory. 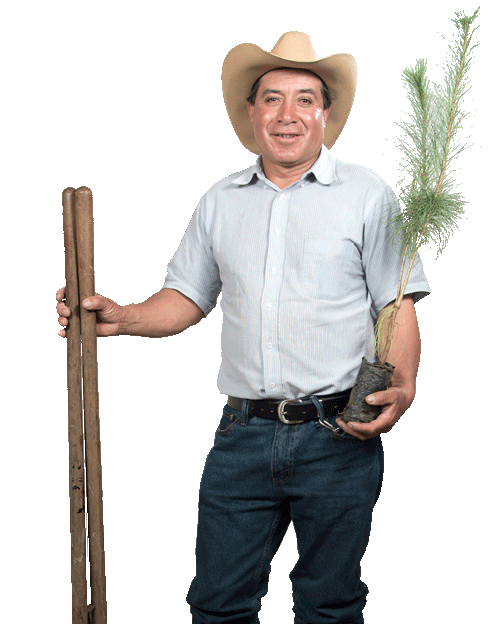 The support is aimed at individual and collective users who own land with a forestry vocation, so that they can enter the programs offered by INAB in its 4 modalities: forest protection, reforestation, agroforestry and exploitation. The support consists in carrying out the technical studies prior to the elaboration of the management plans that will be submitted to INAB, within the framework of the current Forestry Law. This support consists of concrete training initiatives on: recycling, environmental issues, clean energy (hydroelectric, renewable energy, among others), construction of gray water filters, use of sawdust as fuel, formation of brigades against forest fires, and topics on agroforestry. Consists of the establishment of forest and fruit nurseries, potable water systems, basic sanitation infrastructure, and improved stoves.